A SANDIACRE care home worker will be volunteering in Nepal – using her skills and expertise to help women and children. 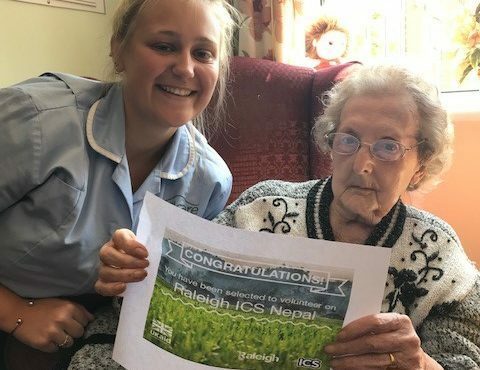 Annerley Reid (a compassionate carer) who works at Longmoor Lodge Care Home Nottingham, is set to spend 12 weeks helping those in need in the Asian country. She said: “Raleigh is giving me this amazing life experience, so I’ve agreed to help them raise some money for supplies whilst we are over there. “I couldn’t be more grateful and so excited to finally do my bit in the world to make a difference and this is where it all starts. She said: “She used to sit on my bed and share my mints with her. Who would have thought she would then become a carer. Samantha Ely, home manager at Longmoor Lodge Care Home, said: “Annerley has only been working at the care home for five months, but it certainly feels a lot longer, as she has known some of the residents since she was a child. “When she told us she was applying to volunteer in Nepal for three months we thought it was a brilliant idea and many of the residents are very interested in what she will be getting up to.